SUMMARY: We report 3 cases of dural arteriovenous fistula (dAVF) with cortical venous reflux (CVR) presenting calcification in the cortico-medullary junction at the bottom of cerebral sulci on unenhanced CT. This likely results from chronic venous congestion with resulting impaired perfusion of the involved parenchyma. dAVF with CVR, which is known to have poor prognosis without treatment, should be included in the differential diagnosis of subcortical calcification on CT. The annual mortality rate of the patients who had dural arteriovenous fistula (dAVF) with cortical venous reflux (CVR) is high without treatment, (10.4%)1 and early diagnosis is desirable. Although cerebral angiography is needed to reach the definite diagnosis of dAVF with CVR, CT scans are frequently selected for initial screening of intracranial lesions. The main CT findings without contrast enhancement of dAVF with CVR reported in the previous literature are hemorrhage or focal edema.1, 2 Calcification has often been found in pial arteriovenous malformations,3, 4 but subcortical calcifications have only recently been reported in association with dAVFs with CVR.5, 6 We report 3 additional cases of dAVF with CVR presenting characteristic calcification in the cortico-medullary junction at the bottom of cerebral sulci. A 77-year-old man with delusion and amnesia was initially suspected of having Lewy body dementia (Fig 1). At initial presentation precontrast CT scans showed curvilinear calcification in the cortico-medullary junction in the left temporal lobe. MR images and MR angiograms were suggestive of dAVF with CVR. External carotid angiogram confirmed dAVF with CVR. Iodine 123-labeled N-isopropyl-p-iodoamphetamine (123I-IMP) and single-photon emission tomography (SPECT) showed markedly reduced blood flow in the left temporal lobe. After complete occlusion of dAVF by the transvenous embolization, his clinical symptoms of dementia improved. To the best of our knowledge, no other metabolic or degenerative disease accounted for the calcifications. A, Precontrast CT scan shows curvilinear calcification (arrowhead) in the cortico-medullary junction at the inferior part of the left temporal lobe. B, Postcontrast T1-weighted image shows multiple foci of curvilinear enhancement along the gyri, indicating dilated venous channels due to reflux (arrowheads). C, Lateral view of left external carotid angiogram shows dAVF at left transverse sinus fed by the middle meningeal artery (arrow) and cortical venous reflux (arrowhead). D, SPECT shows markedly reduced blood flow in the left temporal lobe where the cortical venous reflux was found. A 68-year-old woman with a 3-year history of dementia and a 2-year history of dizziness presented with left-sided sensory disturbances (Fig 2). CT scans at initial presentation showed curvilinear calcification in the cortico-medullary junction, predominantly in right cerebral hemisphere. MR images showed multiple and curvilinear flow voids along the cerebral surface, which suggested the presence of vascular anomaly. Carotid angiograms revealed dAVF at the right transverse sinus with CVR. To the best of our knowledge, no other metabolic or degenerative disease accounted for the calcifications. Although she received repeated transvenous and transarterial embolization, the shunt remained uncontrollable without improvement of her clinical symptoms. A, CT scan shows curvilinear calcification in the cortico-medullary junction at the bottom of cerebral sulci bilaterally but more predominantly in right cerebral hemisphere. B, T2-weighted MR image shows prominent cortical and subependymal veins (arrowheads), which possibly suggests an arteriovenous shunt with cortical venous reflux as well as hyperintensity in deep white matter that was more apparent on the right. C–E, Serial right external carotid angiograms (C and D, lateral view; E, frontal view) show enlargement of the middle meningeal artery with early filling of the transverse sinus and retrograde filling of the straight and superior sagittal sinuses. Cortical venous reflux is also evident in the later phase. A 20-month-old girl presented with a sudden onset of generalized convulsion followed by mild motor weakness of right lower extremity, loss of consciousness, and vomiting (Fig 3). CT scans at the initial presentation showed diffuse atrophic changes and subtle calcification in the basal ganglia and cortico-medullary junction at the bottom of cerebral sulci bilaterally. The calcification in the cortico-medullary junction was curvilinear and predominant on the right side. Partially collapsed MR angiograms suggested dAVF at the left transverse sinus. Cerebral angiography confirmed the diagnosis of the dAVF at the right transverse sinus with CVR mainly on the right. There was no other metabolic or degenerative disease present that might account for the calcifications. A, CT scans shows diffuse atrophy and subtle calcification in the basal ganglia and subcortical region at the bottom of cerebral gyri bilaterally. The subcortical calcification was curvilinear and predominant on the right side. B–E, Right external carotid angiograms (B–D, lateral projection; E, frontal projection) show dAVF fed by the enlarged middle meningeal (arrow) and ascending pharyngeal arteries with cortical venous reflux (arrowheads). F, Repeated CT scans after 1 year reveal a more advanced degree of diffuse atrophy and denser subcortical calcification. By means of transvenous embolization, arteriovenous shunt was partially resolved with partial disappearance of CVR, and her symptom of convulsion became controllable. 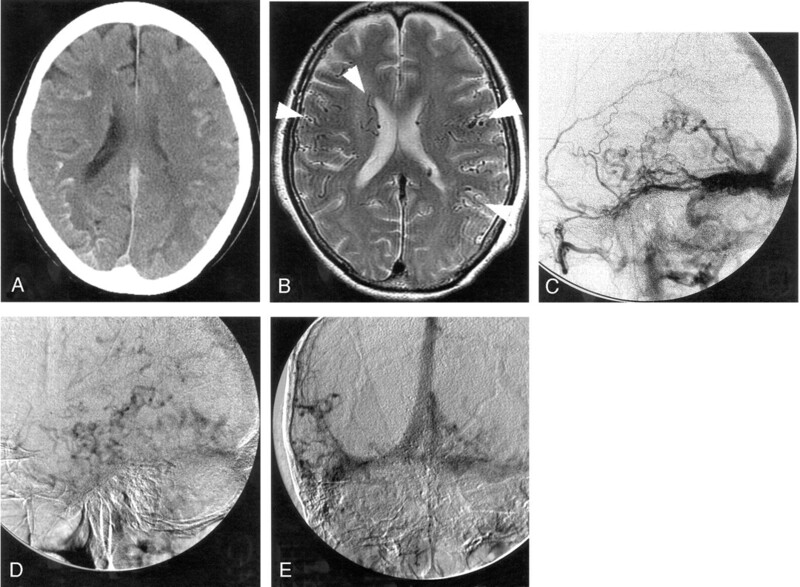 Approximately 1 year after the initial embolization, she developed uncontrollable convulsion again, and repeat CT showed advanced degree of diffuse atrophy and denser subcortical calcification. She underwent transarterial re-embolization immediately followed by surgical isolation of the right transverse sinus and remains free of convulsion. We report 3 cases of dAVF with CVR at the transverse-sigmoid sinus having characteristic curvilinear calcification in the cortico-medullary junction at the bottom of cerebral gyri on CT. Differential diagnoses of intraparenchymal-calcified lesions include metabolic disorders (hyperparathyroidism, lead poisoning), infectious disorders (cytomegalovirus infection, toxoplasmosis, tuberculomas), neoplasms (ependymoma, oligodendroglioma), and vascular malformation, including Sturge-Weber syndrome and pial arteriovenous malformation.3, 4, 7, 8 In addition, Lai et al.5 recently reported a case of subcortical calcification in a dAVF patient with CVR. Although the mechanism causing calcification associated with vascular anomaly has not been elucidated, the calcification accompanied with pial arteriovenous malformation is generally considered to be involved by a dystrophic process due to focal hypoperfusion by the steal phenomenon.3 Also in the patient with dAVF with CVR, Lai et al speculated that the calcification might have been involved by focal hypoperfusion because of the cerebral steal phenomenon or persistent venous congestion.5 By contrast, focal hypoperfusion has been known to be prevalent at or around the sites with CVR on SPECT in 22 dAVF patients with CVR.9 Indeed, in case 1 of our study, calcification was located at the hypoperfused region on SPECT; in case 3, calcification was more predominant on the side with dAVF and more prominent CVR. 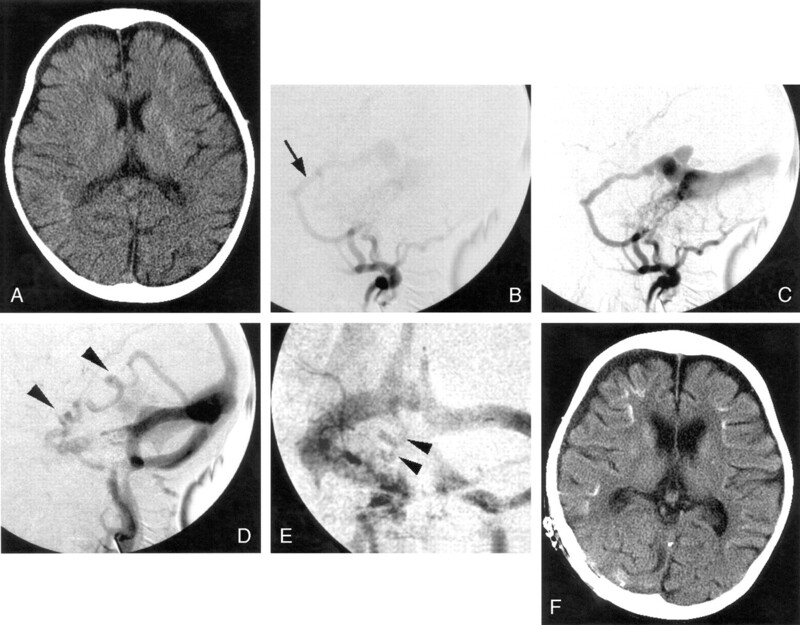 The subcortical calcification became more apparent on CT scans after 1 year of incomplete transvenous embolization. In the remaining patient (case 2), the calcification was more apparent on the side of the dAVF, which was accompanied by the almost symmetrical CVR. In light of the predominant side of calcification and the side of dAVF with dominance of CVR, we suspect that the calcification found in dAVF with CVR might have been associated with hypoperfusion due to profuse CVR and that the distribution of the calcification may reflect the extent of the venous congestion rather than the side of the dAVF. In 4 patients with dAVF with CVR—including a case reported by Lai et al—the involved sites were the basal ganglia in 2 and the subcortical region in all 4 cases. Calcifications in the latter region appear to be characteristic and presented as minute and curvilinear ones predominantly involving the cortico-medullary junction at the bottom of cerebral gyri. This particular pattern of calcification appears distinct from that in pial arteriovenous malformation or other diseases, such as neoplasms but may also be found in patients with lead poisoning or perhaps in hyperparathyroidism. These diseases, however, would show clearly different history and clinical features. Thus, dAVF with CVR should be raised as one of differential diagnoses when subcortical curvilinear calcification is found on CT.